Jim and Margaret Dunn have a vision for Washington County, Iowa. Soon, thanks to their partnership with Kirkwood Community College, their vision will become reality as construction begins this fall on the Kirkwood Washington County Regional Center. 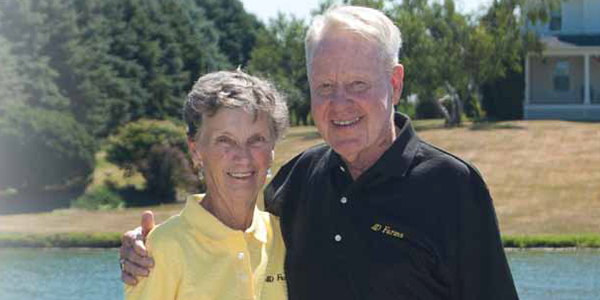 Last spring, Jim and Margaret, along with their sons Dave and Mark and their respective families, donated eight acres northwest of the city of Washington. The planned $9 million facility will provide enhanced learning opportunities for Washington County area students. The gift provides the foundation for a longterm educational commitment: the new center will offer innovative programming, collaborating with several local high schools to bring hands-on technical programs and college-level arts and sciences courses to rural students. "We've been thinking about what we could do to help with education in Washington County area through Kirkwood," Jim explains. "When this regional center idea came up, we thought this could do as much or more for Washington County area and the people who live here than anything else in our lifetime." The Dunns are long-time Kirkwood advocates. Jim has served on the Kirkwood Foundation's Board of Directors for more than 10 years, and the family supports a special Kirkwood scholarship for students who have attended a Washington County high school. "Our loyalty to the college stems from admiration for Kirkwood's dedication to putting students first," says Jim Dunn. "You learn a lot about an organization when you serve on the board," he explains. "I've had the benefit of working with all the good people at Kirkwood. The student does come first. Every decision Kirkwood makes is based on whether it will benefit the students." The impact of the center is huge in terms of diversifying career opportunities and training in the area it will serve. "The broad scope we have planned will make college education more accessible for everyone, from students still in high school up through adults who might need an entirely new career," notes Karen Gorham, the Kirkwood Board of Trustees District 4 representative, which includes Washington County. Margaret Dunn stresses the value of the center's ability to give high school students hands-on career experience while also earning college credit. "This is an opportunity for high school students to be able to take two years of classes, at no cost to their families, that will transfer to the University of Iowa or elsewhere," she says. "Students from all the schools involved will be able to do that." The 35,000 square foot center's diverse course offerings will include architecture/construction, criminal justice, arts and sciences, computer networking, automotive technology, patient care/CNA and more. It's notably more than individual school districts could provide alone. The Dunns envision the Regional Center as a huge asset to the Washington County area - now and in the future. "This is helping people help themselves," Jim Dunn says. "They will be better prepared for life than they would otherwise. And this center will grow and do more good in the years ahead."